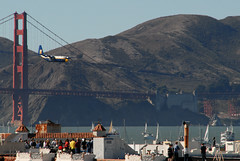 Yesterday afternoon, I went to a friend’s house to watch the Blue Angels Fleet Week airshow from the rooftop of her building. Fleet Week is a San Francisco tradition. Somehow the weather always is amazing on the day of the airshow and this year was no exception. The whole city turned out to see the performance. 06 Oct This entry was written by Shawn, posted on October 6, 2007 at 4:46 pm, filed under event and tagged airshow, blue angels, fleet week. Bookmark the permalink. Follow any comments here with the RSS feed for this post. Post a comment or leave a trackback: Trackback URL. Older: Finally a windy day!